Evolving list of the most useful and interesting free vst compressor plugins out there. Wether you’re looking for straight forward emulations of solid state gear, individual track compression, limiting, multiband or sidechain compression hopefully this extensive list of the best available free compression and dynamic processing vst plugins will help you. As always in no order of preference and will be updated as I go along. 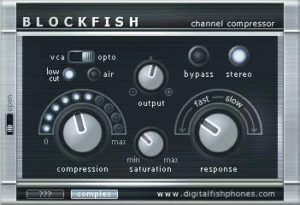 Unlike many other digital compressors, BLOCKFISH has ‘soul’. It likes to bite, but it can be tamed easily once you’ve learned how to use its potential. A classic compressor effect that has a simple and familiar control setup. Rough Rider is a modern compressor with a bit of “vintage” style bite and a uniquely warm sound. Perfect for adding compression effects to your drum buss, it also sounds great with synth bass, clean guitar, and backing vocals. Definitely not an all-purpose compressor, Rough Rider is at its best when used to add pump to rhythmic tracks. Of course, you can use it however you’d like. The Compressor Police aren’t gonna come to your house and give you a citation. Slap it on a track and crank some knobs. Jeroen Breebaarts ‘Broadcast’ – multiband compression style free vst plugin. Dynamic processing – Three bands the frequencies of these are controlled by the X1 and the X2 controls which are on the right side of the console – these are horizontal sliders that basically split the incoming singnal into three. The three bands of the compressor then work on these split frquencies. – Each band can be disabled via the little white square above each band. Spatial processing – ‘Pushing the fader to the right will increase the side signal level. The amb parameter adds a synthetic side signal (on top of the conventional ‘side’ slider that only amplifies the existing side signal).‘ – taken from the manual – I need more time to experiment with this part. Brickwall limiting – the broadcast vst plugin also hosts a very simple brick wall limiter – this can be turned off if needed. It has a pre-gain feature allowing the user to add to the input level only works if the AGC is turned off. AGC is Auto Gain Compensation – which does what it says on the tin. 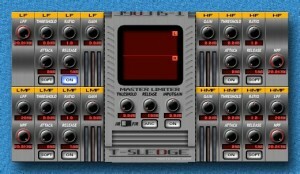 All in a really nifty little plugin to add to VST folder. The BuzComp Free Series is a set of compression plugins from buzzroom. If you’ve tried any of the other free VSTs available from Kjaerhus then you’ll know what you’re getting here. Makes you think though, if these are that good and they’re free how good are the ones you pay for. 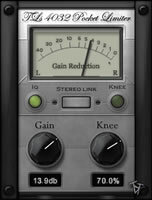 Classic Compressor is a classic analog style VST Compressor Plugin with a lot of warmth and punch. Special designed to use on individual Instruments and Vocal, but also useable on your final mixes. C3 is a free three bands compressor VST . Easy t otweak and with good visualisation for the amount of compression in each band. Flexible dividing filters(ButterWorth Filter or LinearPhaseFIR Filter). Sampling Rate: 44.1k, 48k, 88.2k, 96k support. ‘Conventional compressors are based on peak or rms-level estimation to compute their time-variant gain or attenuation. This property of most compressors often causes undesirable intermodulation distortion and pumping/breathing artefacts. 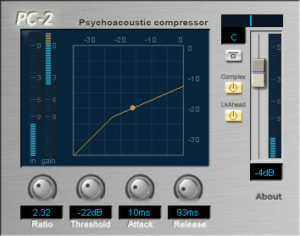 PC-2 features a ‘psycho-acoustic relevance’ mode. Instead of using a peak or rms-level estimation, this mode employes a perceptual loudness model to compute the loudness of the input signal. This perceptual loudness model is combined with advanced attack and release stages that model peripheral adaptation of the human auditory nerve. The result is a very transparent compression characteristic, even with very short attack and release times. D2 is an all-rounder compressor with an easy to use interface. It demonstrates the compressor algorithms of its big brothers, bathtub and sidearm while keeping the interface simple for quickly dialling in some common settings. D2 can be heavy or subtle, razor quick or gentle, clean or dirty and is happy as an insert or buss compressor. Invada Free VST Plugins: Compression. 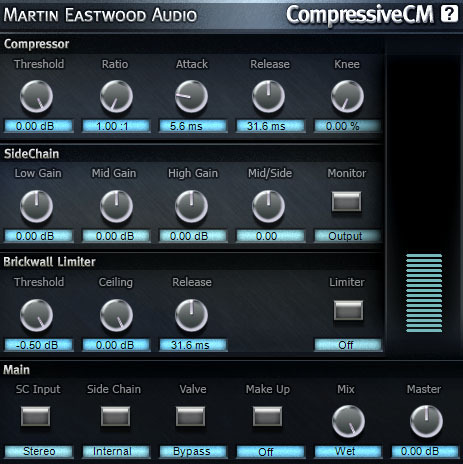 As a reader of the always excellent ‘Computer Music Magazine’ Martin Eastwood was brought to my attention because of the excellent ‘CompressiveCM’ exclusive only to Computer Music Magazine free vst plugin. ‘CompressiveCM features an RMS compressor with both internal and external sidechains, as well as parallel compression, brickwall limiting and vintage valve emulation to add analogue warmth to your mix. This plugin is worth the price of the magazine alone, ands you have the added bonus of a bloody good read to boot. Not to mention all the other plugins available on the companion DVD. 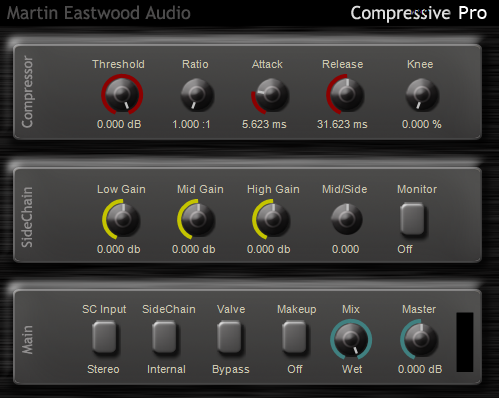 Compressive Pro is an external side chain vintage analogue modeled RMS compressor. The external side contains a 3-band EQ and mid/side controls to allow complete control of audio dynamics. W1 Limiter is a clone of Waves L1, with identical output. 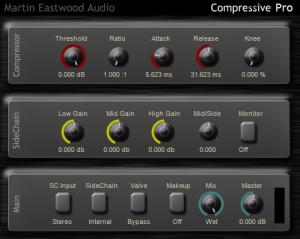 Endorphin – free vst limiting and dualband compression plugin. Global ‘de-comp/sat’ section. It’s you who decides how the unit reacts to large amounts of gain reduction as well as when and how to saturate. Maximum output: -0.1dBFS. This is very helpful when using the plugin as the last stage before burning the CD. Very cool freeware VST plugin Maximiser. Input, Output, Gain, Drive & Release. This maximizer / limiter VST works great and is very easy to use. Featuring transparent brickwall Limiting with 0 db stop and variable knee from 0% to 100% to keep limiting distortion at a minimum. “IQ” mode allows users to get a more “intelligent” release from the knee with program emphasis. Low latency for live performance use (40 samples at 44.1khz = ca 1ms latency). Stereo link to preserve stereo field. Supported samplerates: 44.1khz – 192khz. If you’re looking for sidechaining plugin effects the compressor plugin from Slim Slow Slider is an excellent addition to your VST plugin folder. The Sidechain compressor comes in a stereo and a mono version. Really quite easy to use, just add the effect to the effects bin of the track you want to affect. Then route the track you want to ‘influence’ the compressor via it’s output. Click here for Sonar Sidechain tutorial, principle should work for other DAWs. Also available for free is the Side Chain Gate/Expander. MeldaProduction have kindly offered this free vst compressor plugin that also has sidechaining capabilities. * Actual source level indication inside the shape graph – you always know, what dynamic value you can actually expect on the input and output, and what gain-reduction MCompressor performs. * Signal maximization – compressors actually lower the signal above treshold. MCompressor can compensate the reduction to ensure, that if the source has reached 0dB, result will too. This is especially useful for mastering, since you want to maximize loudness and use the entire bit resolution. * Fully automatable (except for the custom shape graph). * Global preset management – using a title button you can save your settings, which are shared on the computer, so you can easily access them in another songs.